Gran Fondo Cymru AKA "To ride or to puke?" Here’s my slightly belated account of our sporting challenge on 29 May. “To ride or to puke?” was the subject line of Damon’s email to me a couple of days before we were due to participate in a 180km / 110 mile bike ride in the hills of Snowdonia, North Wales as first described here. He was desparately trying to recover from illness in time to be able to do the ride. To his credit, Damon didn’t bail and although he didn’t feel well enough to do the 180km Gran fondo route, he completed the 65km Sporting route in a really good time for someone not in top form . You can see my photos of the weekend on flickr. We (Kate, G, D and I) set off from Oxford the day before the GFC for the 170 mile drive to Bala in Wales and stayed at the Bala Backpackers which was cheap, clean, central and quiet enough to get a decent kip. In training, the furthest I had done was 165km (my first 100 mile day) which partly included a 100km event organised by Audax UK the long distance cycling association. Also threw in a few 120km and 100km rides in, trying to find all of the hills in the vicinity of Oxford. A favourite loop of 80km is captured in this blog post. Another favourite is the 50km loop to Brill in Buckinghamshire as visualised here. We three set off from the Leisure Centre in Bala and immediately hit an incline on the way out of town. For the first hour or so we caught the wheels of some fast groups including one with several members of the Reading Cycling Club. Soon enough, Gerard and I bade farewell to Damon who continued on the Sporting (65km) route. At the first food stop, the amount of pasta consumed in the previous 2 days seemed to catch up with me and the urge to find the “facilities” became an imperitive…so much so that I didn’t realise that I was using the ladies’ section of the toilet block! 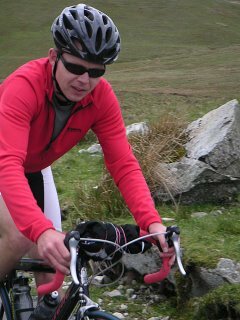 Anyhow, Gerard and I continued north-west towards the coast, climbing the Llanberis Pass into a killer head wind. We unfortunately didn’t have the benefit of drafting a group of other riders until the last bit of the long, exposed drag from Betws y Coed to the Llanberis climb. I stopped to take a photo of Gerard approaching the top of the hill at Pen y Pass and got engaged in conversation about cycling with a Czech tourist…”I used to have a bike almost as good as the pros, but that was about 20 years ago”. The headwind buffeted us all the way to Caernarfon, where there was a timing point at the castle. We then headed back inland and benefitted from a tailwind for most of the trip back to Bala. The toughest hills were yet to come, however. As the road rose upwards, I didn’t feel too bad and was able to pass most of the cyclists that began the longer and steeper climbs with me. Unfortunately, I felt like complete crap at the top of the killer hill that led to the second food stop and spent a very uncomfortable time feeling like throwing up. I couldn’t eat anything and almost couldn’t even choke any water down…not good on such an endeavour. I decided to press on but about 1km out of town, I had to climb off the bike again…contemplating having a big spew. “Who’s dumb idea was this anyway?” Oh yeh, that would have been me. After 5 or 10 minutes by the roadside I emmitted 2 gigantic belches and that seemed to do the trick. We pressed on and in contrast to other reports I’ve read, the last 30-40km, which included some fantastic climbing up a single-track road with 15 percent gradient descents, felt like a relative doddle. After I’d descended to Llanuwchllyn and hit the southern end of Lake Bala, I finished the last 10km strongly. Even though I haven’t done all that much cycling since then, it’s whet my appetite for more…Damon, Gerard and I are planning some more long distance cycling for the remainder of the summer! Potentially few blog posts over the next couple of weeks as Kate and I are headed off to the Western Isles of Scotland for a couple of weeks this Saturday. Sounds like an epic ride Ed! Well done on finishing it and not barffing!